Maybe “heirloom” is a strong word to use for my mama’s pumpkin bread. Or maybe not. My mom did not love to cook, but what she did cook she cooked well. Very well. And this pumpkin bread was one of the things that she was known for, along with peach pie and cowboy cookies. (Sweet tooth much?) In fact, once a family friend of ours who was the head baker at a little bakery asked my mom if they could use this recipe at her bakery. Impressive, right? Mmmm….I’m enjoying some right as we speak, along with a warm glass of Choffy, of course. (What is Choffy, you ask? Brewed chocolate. Yes, you read that correctly. Get more details here. I became a distributor of the stuff because I love it so much that I wanted the discount. True story.) Choffy and pumpkin bread together is the perfect mid-Fall afternoon snack! First you will need to gather your ingredients. And here is a tip from me to you: it is freaking hard to find canned pumpkin if it isn’t October or November, so stock your cupboard to get you through the year. Seriously. 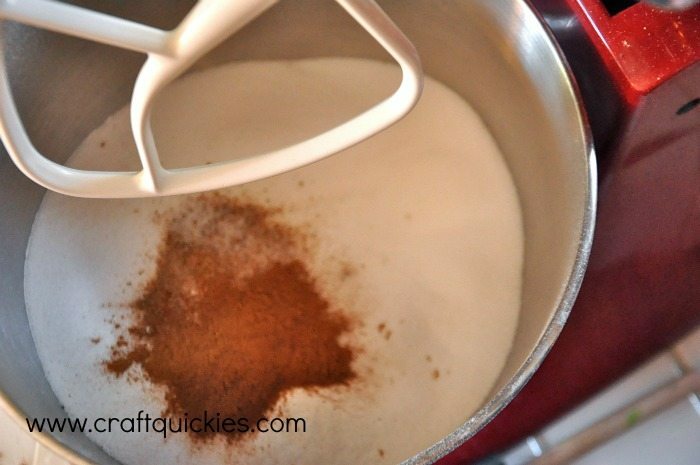 Mix together the flour, sugar, nutmeg, cinnamon, baking soda, and salt. 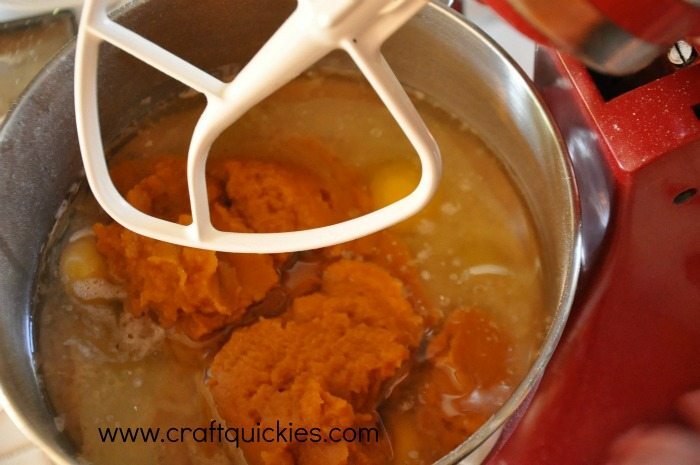 Add the cooking oil, water, eggs, and canned pumpkin into the same bowl and mix well. IMPORTANT: You may think that a small can of pumpkin is two cups because of its weight. The recipe is looking for two cups in liquid ounces not in ounces as a weight unit. If you look at the serving size you will find that a small can only has 1 1/2 cups of pumpkin in it. Of course, the large cans have much more than that. So you can skimp on the pumpkin or have leftover pumpkin. Your call. I always go for the full amount. Add the chocolate chips (or coconut or chopped nuts). You can adjust this to taste. Most normal people use one cup of chocolate chips. Some other people I know ~ *ahem* ~ may add two cups of them. Grease and flour your pans well. (a.k.a. 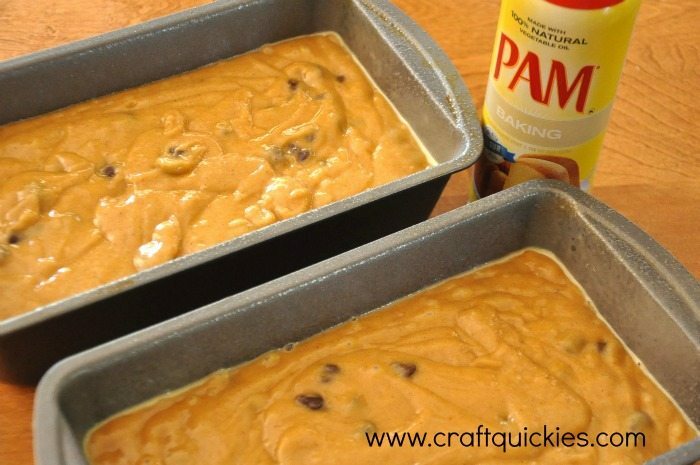 Spray the heck out of them with Baking PAM. Amazing stuff!) Pour the batter into two or three bread tins. Bake for about an hour at 350 degrees. It is even more divine than usual when it is warm, so ENJOY! No butter necessary, believe me! Combine flour, sugar, nutmeg, soda, salt, and cinnamon. 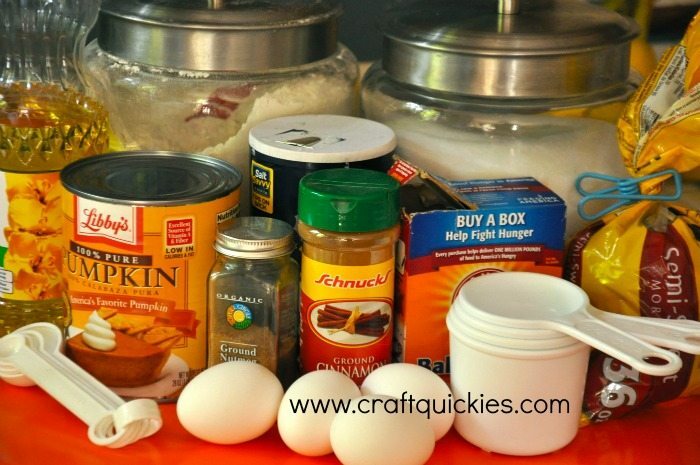 Add cooking oil, water, eggs, and pumpkin. Mix well. Add chocolate chips, coconut, or chopped nuts. Mix. Pour into two or three greased and floured tins. Bake for about 1 hour at 350 degrees (depending on the size of your pans). When a toothpick comes out of the center clean your bread is done. I use the entire 12 oz bag of chocolate chips. Wouldn’t make it any other way! Gooey, chocolatey goodness. Curse you! 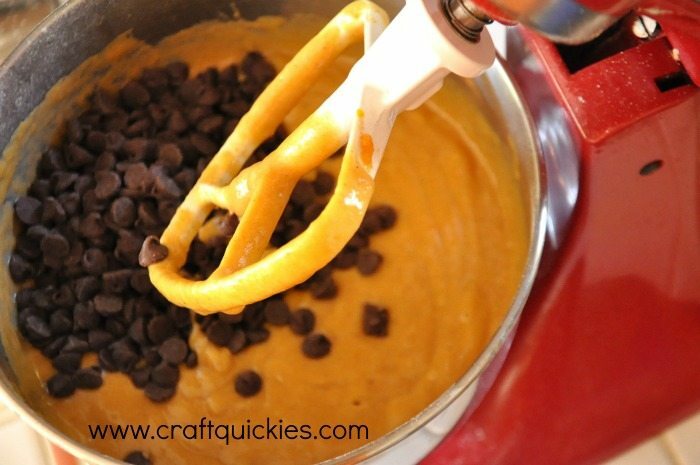 I am out of chocolate chips and dying to make this right now, but can’t do it without them – just wouldn’t be right. Great pics! Thanks for sharing this!!! This looks so good, and we are definitely going to try it! my daughter has taken over baking our pumpkin bread for a while now. Since I have a challenge with chocolate she used the butterscotch chips in a small small bread pan and ohhh my how delightful. My hsb tried some of it and now he doesn’t know which is best. Mmm….that sounds super yummy, Brenda! I’m going to have to try this! Have you tried this with any potion of whole wheat flour? What a great bread o gift for the holidays! The recipe is simple and efficient with a taste that will make everyone happy! Thank you for sharing. Amazingly easy recipe, I had everything out and ready in about 10 minutes, breads are in the oven baking as I type and we cannot wait to try them for breakfast tomorrow morning. I’m bringing two mini loaves to friends and the rest will be for our family of 4 which absolutely loves anything pumpkin. Thanks for sharing your recipe. You bet! This bread is my FAVORITE!!!! This sounds heavenly! Aren’t mamas recipes the best? And grandmamas? I added this to a group Pinterest board for heirloom recipes. You’re welcome to join or share family recipes on other social media using #ProjectSTIR. Really enjoying all the holiday recipes that are being shared right now. I love helping family recipe blog posts get exposure. Let me know if you have any others. This sounds like a classic treat! Thanks for sharing on the What’s for Dinner Link up! This looks so good, Anything with Chocolate Chips! YES Please!, I want to try the Zucchini bread too! Thanks for sharing ! 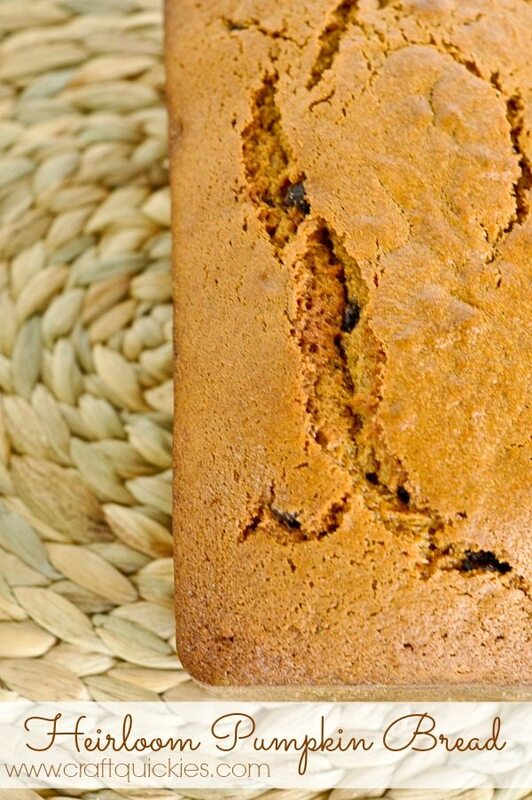 Your Pumpkin Bread looks delicious! Thanks so much for sharing with us at Full Plate Thursday,we are so happy to have you join us. Have a wonderful week and come back to see us real soon! This sounds just like my mom’s! Thanks for sharing at the What’s for Dinner party! 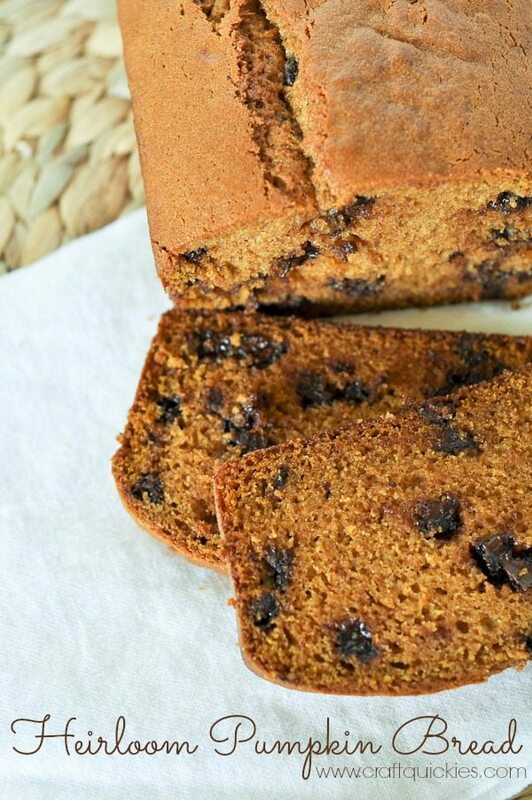 I love pumpkin bread with chocolate chips. One of my favorite things to eat every Fall. Thanks so much for sharing your recipe with us at the #HomeMattersParty this week. Looks yummy! Thanks for sharing at the Inspiration Spotlight party. Pinned & sharing.